As the assistant dean of admission for Milton Academy, Pamela Pleasants spends her autumn days interviewing candidates, talking with prospective families, attending high school fairs, visiting middle schools, and trying to find time to help drive students to their community-service sites. On top of all that, the Milton resident and dear friend of mine is the mother of an 8-year-old boy, and is looking forward to overseeing the preparation of Thanksgiving dinner for 150 people at her church. To know Pam is to understand that she thrives on the hectic pace of her life and would not have it any other way. However, she readily admits that carving out personal time for reading has taken more of a back seat than she would like over the last few years. 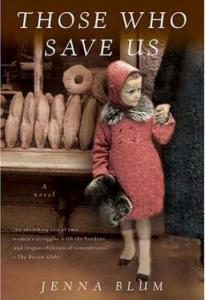 The very first thing she said about “Those Who Save Us’’ was: “This is a riveting novel that vividly shows us about both the grace and brutality of human interaction in desperate times.’’ She also commented that its wonderful prose, strongly developed characters, and an unflinching look at Nazi Germany allowed the very human story to come through. All I can say is that much like Pam, I tore through “Those Who Save Us’’ in a couple of days. This powerful story attempts to examine the choices made by ordinary German citizens during WWII as they witnessed their Jewish friends and neighbors facing unspeakable horrors every day. Unlike Holocaust literature that focuses on the experience of Jews, Blum’s novel explores the non-Jewish German citizen’s dilemma of whether to confront the crimes being committed against the Jews, or try to ensure their own survival by ignoring the persecution. The novel tells the tale of 18-year-old Anna Brandt in Weimar in 1939 and the flowering of her romance with a young Jewish physician just as the Jews were being forced into hiding or being torn from their homes and sent to concentration camps. Anna has to flee from the home of her Nazi-sympathizer father after her lover is discovered hiding in the family attic. Attempting to find refuge herself, a pregnant Anna garners the unwanted attention of Buchenwald’s highest-ranking SS officer and must face some very difficult life choices of her own. The choices young Anna made in 1939 exert their impact five decades later in the life of her grown daughter, Trudy, an unmarried professor of German history in Minnesota. Trudy begins to unravel the mystery of her own heritage in the midst of interviewing German citizens about life during the Holocaust. Trudy must come to terms with who her mother really was and what secrets she kept, as well as who she herself hopes to become. This is a book that inspires reflection in any reader, regardless of ethnic background. It leaves you asking, “What would I have done as an ordinary citizen during these horrible, extraordinary times?’’ Then, in the aftermath of these choices, what happens to a life that is haunted forever by guilt or the quest for redemption? Pam’s belief that books give us the opportunity to gain insight into our own lives is certainly proven with Blum’s novel. I found myself wondering whether I would do the “right thing’’ if put to the test, and I think others who read the book will find themselves asking this, too. Nancy Harris can be reached at dr.nancy23@gmail.com.